Did you know that the black and white cookie originated in New York? The half vanilla and half chocolate cookie is a NYC staple and that's how we see the Public Desire Chaos Ankle Boots; we're sure they will be a fashion staple. 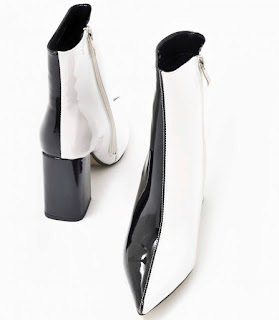 The contrasting ankle boots feature a half white and half black patent upper, pointed toe, and a 3.6" a flared block heel. The best part, it's only $59.99. If you prefer to see your world in more than just black and white, the Chaos also comes in burgundy patent/suede, black and pink patent, black patent/suede, and black and pewter patent. Get one or more colors on www.publicdesire.com. ***UPDATE: We just heard Beyonce wore a pair of shoes from this footwear brand, so you know what that means........get your shoes before their entire inventory is sold out and while prices are still affordable.